In addition to concrete floor joint repair measures, every day wear and tear on a concrete floor can cause the surface to chip and crumble. This effectively means your concrete surface breaks into small pieces that create pock marks, nooks and crannies, deterioration, etc. 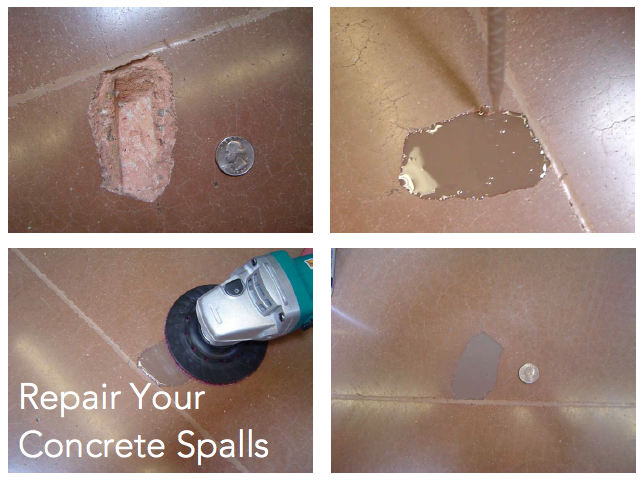 However, surface spalling can be repaired using these steps. Step 1. Make cuts with blade or chip out section at outer edges of spalling with a chisel to at least ¾-inch deep, creating a vertical edge. Step 2. Grind out or chisel any spots of the floor with the work area that are higher than the level of the edges. Vacuum, brush and wipe the area clean with a rag. Step 3. Overfill the area with repair material and trowel smooth and slightly higher than the floor surface. Step 4. Once repair material is cured, remove any overfill to create a smooth, flush surface by grinding with a high quality polishing pad. Runyon Surface Prep carries a full line of Metzger/McGuire repair materials designed for use on industrial or retail concrete floors to repair cracks, surface spalls and pop-outs, as well as other defects that happen over time on concrete surfaces. Find Metzger products on our website and videos of them in action on our YouTube channel. Please be sure to reach out with questions via the comment section below or by contacting us. You are tasked with fixing a deteriorated floor surface. Before your begin the repair, it’s important to determine the cause of the defects, which will help you find the best long-term repair strategy for the project. Any structural causes will need to be corrected prior to filling a joint. Joints can be filled three different ways, depending upon the extent of the floor’s deterioration. If the existing filler is well-bonded structurally to one or both sides of the joint, you can refill voids without removing it entirely, or making a partial removal. However, if the existing filler is not well-bonded or appears to be installed improperly, remove it completely before making the joint repair. Consideration 1: Select floor repair materials that meet the requirements of a facility’s operations. Consider frequency and type of traffic — foot, vehicle, heavy equipment. Also consider building temperature, the surface area to be repaired and the work window you have to complete the repair. This will help determine whether you need to use more rigid products for large repairs, if epoxy products will have the time required to cure or if you’re working in a freezer or cooler room. Consideration 2: Prepare the surface for long-lasting repair by making sure the area is well-defined and cleaned properly prior to filling with repair material. Proper surface preparation is critical to a successful repair. Take care that the edges of joints, cracks and surface spalls are at least 1/2-inch deep and the area is not only clean, but dry prior to filling. Consideration 3: Avoid a concave or dished joint by filling with repair materials slightly higher than the floor surface. Once cured, the excess material is ground or shaved to meet the original surface, restoring a smooth, continuous, flush profile across the floor. Step 1. Use joint cleaning saw or right angle grinder equipped with a braided wire wheel or suitable diamond blade to remove existing joint filler to a nominal depth of ½-inch below surface, making sure all filler residue is removed from joint walls back to clean concrete. Vacuum joint clean. Step 2. Overfill joint with appropriate filler. Allow filler to cure, then razor flush with floor surface. 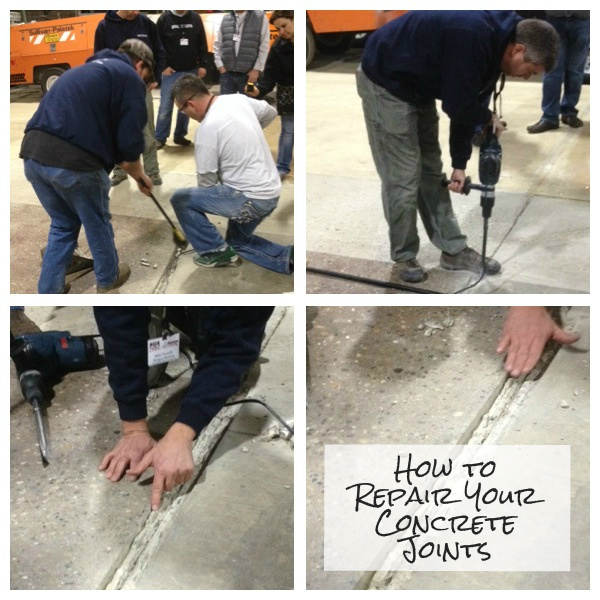 In addition to these tips, products and processes, please take a look at our YouTube page for specific joint repair videos taken during various training classes (presented by experts from Metzger/McGuire). Also, please comment below or contact us with additional questions, or visit our website for a full listing of Metzger/McGuire products. Crack chaser saws are designed to help simplify general crack repair in concrete, asphalt and stone. 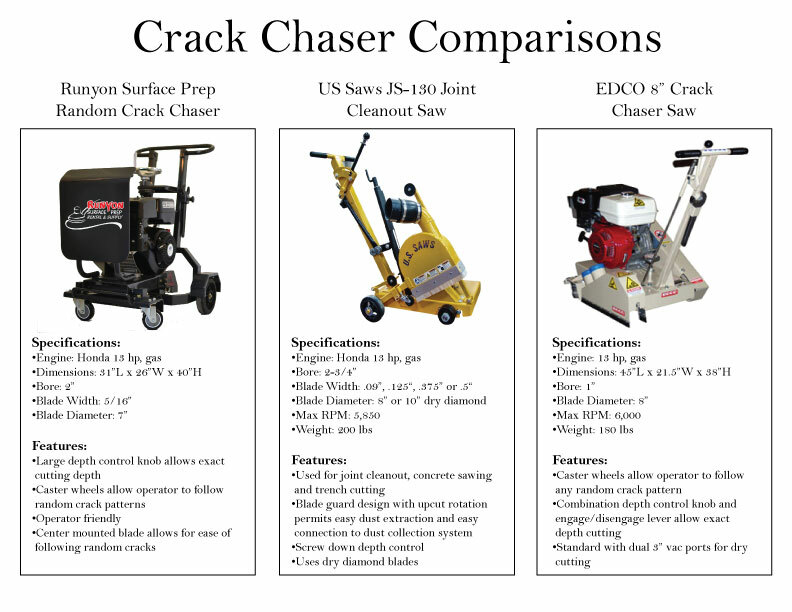 Building contractors, road crews and concrete contractors use crack chaser saws to repair roads, driveways, foundations and sidewalks because the blades not only cut through different materials such as nuts, bolts, rebar, fiberglass, PVC, ductile, HDPE, wire, rock, stone, epoxy, polyurea and caulking, they can follow, or chase, a random crack pattern and widen it so the cracks can be mended with fillers. In addition, crack chaser blades typically will not chip, crack or damage the surface that surrounds the crack. A random crack chaser saw has a center-mounted blade and caster wheels that allow an operator to follow random crack patterns in the surface of the work area. Typically, an operator can also set a cutting depth with ease, while walking behind the machine. Joint cleanout saws are use for cleaning out joints as well as concrete sawing and trench cutting. The up-cut rotation of the blade allows for complete material extraction and the saw can include an easy connection to a dust collection system.